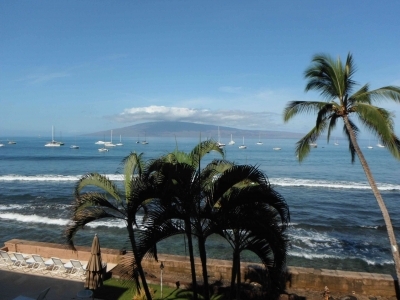 Lahaina Roads is one of 2 oceanfront resorts in Lahaina Town. It is a small, and by far the most home-like, with lots of owner occupants, in a very nice area of north Lahaina. You can walk most everywhere (Safeway, Ka'anapali beaches, the Cannery Mall) or take the Maui bus all over the west side. In car-intensive Maui, this resort makes it so easy, you might find you almost don't want a car - you could just relax on your lanai and watch the green sea turtle activity until the sun sets lingeringly over Lanai, then stroll down to Mala or Honu for upscale oceanfront dining. Or choose Aloha Mixed Plate, right next door, for a casual dinner and listen to the music of the Old Lahaina Luau wafting over from next door.